Throughout the years we have been a part of countless weddings and galas and have seen and experienced just about everything imaginable. Here is a small list of tidbits that I have picked up and would like to share. _ See Each Other First + Unless you are completely bound to not seeing each other before the ceremony, really think about taking a good 45 minutes beforehand to see each other first. It will help with the jitters and anxiety and will give you a chance to talk to each other about the excitement of the day so far. It also gives your photographer an opportunity to take some amazing shots with natural lighting which gives a higher quality photo. Trust me, you will still have the butterflies walking down the aisle and your partner will still be completely blown away by your beauty. _ Spend time alone + After the ceremony, walk down the aisle hand in hand into a private room for just a few minutes to catch your breath and thrive on the fact that the two of you are now legally bound and forever committed. It was quite a ceremony, big or small, and you need time to really revel in it. Once you step out to greet your guests, the party begins and the day will fly by. 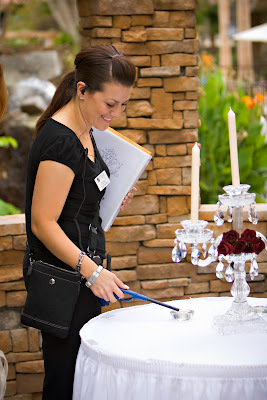 _ Entertaining is not just about Music + Think about another specific activity your guests can be apart of at your wedding. Not everyone will dance the night away and it's just sad to see so many people sitting at the reception tables who appeared to be bored. Maybe they are unsure about their dancing so why not hire a ballroom dance teacher, or maybe rent a photo booth so your guests can take endless silly pictures of themselves. Try a cognac and cigar bar with a lounge area for those guests that want to step away. The key is giving them the option to do so. Dinner and dancing just doesn't cut it anymore. _ Hire a Planner + Every client that I deal with has no idea what they are about to get themselves into, rightfully so. The wedding industry is a billion dollar industry so I highly advise you to have a professional advocate that will assist and be your guide through this ever so stressful process. Do your homework and check out his or her credentials and experience, check references, and most of all make sure you like their personality. This person needs to be someone you can see having a very close relationship with for several months, if not years, while planning this magnificent event. It is important that you and your planner communicate well to create the vision that you have for your event.